Matthew Stafford ruined everything. 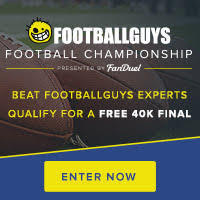 For the first six weeks of the season, FanDuel was awarding $1 million to first place in their featured GPP. Then, someone went and won that million dollars with Stafford as their quarterback. Now the first place prize has been cut in half. This is why we can't have nice things, Stafford. Thanks. In seriousness, we were all over Calvin Johnson last week as a contrarian play. So it's not surprising that Stafford would also have a solid game. Having the best game by quarterback, from a fantasy points perspective, wasn't necessarily expected, but his $6,900 salary last week was the lowest it has been since 2010--long before any of you played DFS. In short, he was the perfect contrarian play: a veteran quarterback that sometimes has huge games, with one of the best receivers of this generation, against one of the worst passing defenses. Those are the situations we need to find every week (even it only wins us $500k). Below is an excerpt from this week's contrarian write up. You can read the rest here. With the majority of the crowd gathering around Carson Palmer and Philip Rivers, we can move to Matt Ryan for the same price and less exposure. Ryan is hardly a model for consistency but still ranks 11th overall among quarterbacks. This week he travels to Nashville to face a defense that looks better in the stat column than they do on the field. They’ve allowed an average of 17.9 points to quarterbacks, which ranks 16th, but are allowing the most fantasy points per attempt. Even if you remove rushing points, the Titans still rank third in points per attempt. For the first time in weeks, Julio Jones isn’t listed on the injury report. We like that the over/under in this contest is a healthy 47 points, third highest of the week, and we’ll take a Ryan/Jones stack. Only four teams have allowed more passing yards than the Colts, who rank sixth in fantasy points surrendered to quarterbacks. Drew Brees is showing his age but still capable of putting up big numbers when the game script calls for it. He has now thrown for over 300 yards in three consecutive games. We’d like to see a few more touchdowns to go along with those yards. The Colts have allowed 11 on the season, sixth most, and are favored in our highest over/under of the week at 58 points. Even though he’ll set us back $8,400, Brees looks like a nice tournament play. As does his opponent Andrew Luck. It’s sort of confusing that the crowd is still shy with only 4.1 percent of Thursday rosters acquiring his services. His price tag of $8,900 is a discount, relatively speaking. Last week, in his first game back from injury, he dumped 312 yards and three touchdowns on the Patriots, threw the ball 50 times and rushed four times for 35 yards. It’s possible that Frank Gore sneaks in a touchdown, but we’ll fire up Luck with confidence against a Saints team that is allowing the third most fantasy points per attempt to quarterbacks. In the bargain bin, we have a high-risk play with Landry Jones. He was excellent in relief of Michael Vick last week, in which he completed 67 percent of his passes for 168 yards and two scores. Be warned, however, that 88 of those yards and one of those touchdowns came on one big play. That aside, he couldn’t have a better defense to face in his first NFL start. The Chiefs’ secondary is awful, having allowed 14 touchdowns to four interceptions, and the third most fantasy points per game to quarterbacks. Of course, there is a reason the Steelers acquired Vick and pushed Jones down the depth chart. So there's a lot of implied risk here. But $6,000 gives us a world of roster flexibility. Asking Jones for 18 points isn’t exactly a longshot, considering he scored 16.3 last week in 1.5 quarters of football.